Anti-pipeline protestors have left a huge mess of garbage, human waste, abandoned vehicles and more in a flood plain next to the Missouri River in North Dakota. As they struggle to keep all this pollution out of the river, officials want the world to know who caused this problem: Activists from out of state. “When we take a look at the figures and pull out where people are from … you definitely notice that not a lot of North Dakotans are in that group,” Rob Keller, public information officer for the Morton County Sheriff’s Department, told Western Wire. Thousands of anti-oil and gas protestors have camped at the confluence of the Cannonball and Missouri rivers since August trying to block the construction of the Dakota Access Pipeline. Under pressure from “keep it in the ground” groups, the Obama administration pulled back the approvals needed to build the final section of the pipeline under the Missouri River. But those approvals were reinstated by President Trump and the U.S. Army Corps of Engineers. North Dakota Gov. 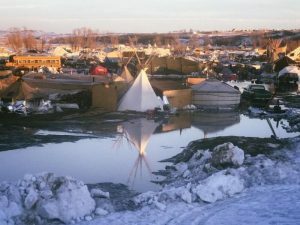 Doug Burgum (R) has issued an emergency evacuation order for the protest site “to avoid an ecological disaster to the Missouri River.” As Western Wire reported last week, the site is covered in debris, trash and untreated human waste from months of occupation by protestors, and officials are also worried about the cars and trucks that activists brought to the site. Seasonal flooding from melting snow threatens to sweep all these contaminants into the river, and one car has already been found in the water, according to the sheriff’s department. Under Burgum’s order, the deadline for protestors to leave is tomorrow. A similar order from the U.S. Army Corps of Engineers, which manages the land, has the same deadline. Meanwhile, the Standing Rock Sioux Tribe, which has opposed the pipeline and continues to fight the project in court, asked the protestors to leave weeks ago. Protestors have repeatedly clashed with law enforcement during the months-long protests, leading to hundreds of arrests. Using those arrest records as a guide, it’s clear that the vast majority of the protestors came from out of state, Keller said. “Just six percent are from North Dakota,” he said. As of early February, the arrest records show 47 other states and four different countries, Keller said. 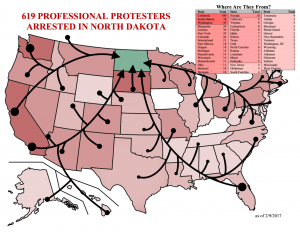 The sheriff’s department even produced a graphic to show the influx of activists from outside North Dakota. Among the activists have been a number of celebrities, including actress Shailene Woodley, who was arrested, and Mark Ruffalo, who was not. The cleanup situation facing tribal, federal, state and local officials is very challenging, Port said. Because protestors have refused to leave the site quickly, crews are running out of time before the area becomes inaccessible. “Even if they manage to get all the trash and the cars out, which they are not necessarily confident of at this point, the damage done to that land is going to take a long time to heal,” Port said.